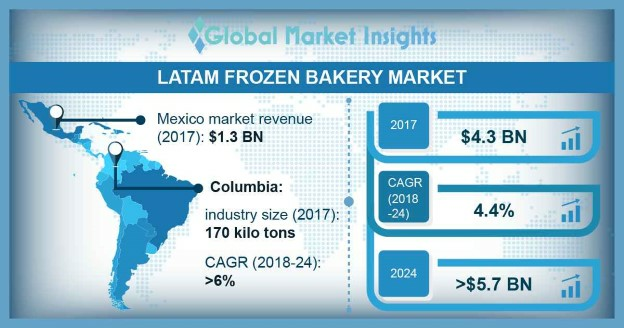 LATAM Frozen Bakery Market size will surpass USD 5.7 billion by 2024; according to a new research report by Global Market Insights, Inc. In terms of volume, bread segment will be accounted for more than 63% of the overall LATAM frozen bakery market by 2024 owing to the increasing consumption of bread in the region. Significant consumption of bread across in all bakery products will positively influence the LATAM frozen bakery market. On the basis of product, ready-to-prove products will show the decent growth of more than 3% in forecast timeframe. This is all owing to surge in the usage of ready-to-prove products by artisan bakers in Mexico and Colombia. Rising number of artisanal bakers in the region will increase the consumption of ready to prove products in next seven years down the line. The major LATAM frozen bakery industry players are General Mills, Groupo Bimbo, BredenMaster, and Europastry. The industry ecosystem of LATAM frozen bakery witnesses strong supply chain of frozen dough supply to key end-users. Additionally, strategic mergers & acquisitions and new product development plays a key role across the industry’s value chain.